Muscle Mountain and Ben Hope have the measure of Ultimate Stride and Brad Williamson. Ian Dobson hasn’t had much to cheer about since the days of Christian Cullen and Mainland Banner but he has some interesting months coming up with Muscle Mountain and Cullenburn. 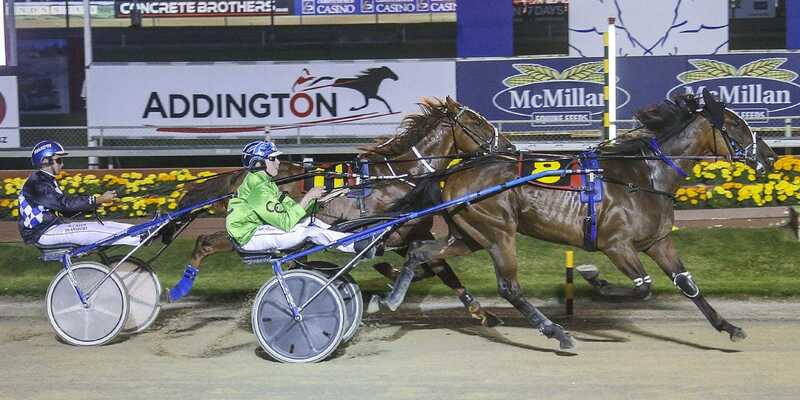 The former maintained his unbeaten record in the two-year-old trot at Addington on Friday night and completed a double for Dobson after Cullenburn’s authoritative resuming win over Nandolo and Smokin By. Trainer Benny Hill has been playing a waiting game with Cullenburn, who he still describes as a “big baby”. “He’s always been an immature and weak horse which we’ve had to keep tipping out to allow him to get stronger and he’s improved each time in,” said Hill. Dobson bought Cullenburn, a brother to Locharburn, at the Christchuch yearling sale for $160,000 and he finished third on debut in the Sapling Stakes won by Cole Porter in 1.53.9 but had just one more race before being spelled. He won a Breeders Crown heat and a grade race at Addington that winter and Hill then tipped him out again and took aim at the Sires Stakes series. He was third in that final won by Chase Auckland over King Of Swing in a 1.52.2 mile-rate, although he merely had to follow that pair around after drawing the inside of the second line. Hill then spelled Cullenburn again and set his sights on the New Zealand Derby, although he only made it as far as the Flying Stakes before going to the paddock again. He reappeared last winter for two wins and two seconds and was then freshened again, winning first up again in October before finishing third in the Aged Classic at Kaikoura. Cullenburn wasn’t disgraced when running fourth and fifth at the Cup meeting in strong company which included Turn It Up, Elle Mac, Funatthebeach and Henry Hubert and then Hill tipped him out again. “He’s always gone very well fresh so I just gave him the one quiet trial a fortnight out from racing. “He’s got the Superstars race next and the blinds can come for that as he never saw the other horse (Nandolo) coming back at him. Dobson is racing Muscle Mountain after he was passed in at the Premier Sale, having bred him from Paramount Faith, an unraced Pegasus Spur half-sister to Paramount Geegee, Paramount Queen, Paramount Dream and Paramount King. The Muscle Hill gelding is the first foal from Paramount Faith, who has since lost foals by both Muscle Hill and Trixton. Muscle Mountain has been pretty much faultless in his career to date and started from post eight before Ben Hope slowly worked his way to the lead with a lap to travel. He was immediately supplanted in that role by Ultimate Stride but Muscle Mountain always appeared to have the favourite covered in the run home. There was also an awful lot to like about the performance of Ultimate Stride on debut however after missing the start by several lengths and that pair look head and shoulders above the rest at this point. Hill completed a double of his own later when Double O Heaven won second up, the one-win four-year-old daughter of Auckland Reactor holding out the much better-performed mare Enchantee to give Ricky May a treble. Double O Heaven had a stint with Steven Reid in Auckland last year where she had a win and five placings from seven starts, earning over $18,000 in a couple of months before returning home on a 55 rating. Hill races Double O Heaven with Glen Scott after the latter sorted her out from the Premier Sale for $9000. Double O Heaven was reportedly backed at $5 on Fixed Odds for $15,000 and must have completed a forgettable night for the TAB bookies after a run of All Stars favourites won and also Alta Maestro was the centre of a betting plunge where he dropped from 10s into 4s. The only mercy for bookies no doubt being Ultimate Sniper’s early gallop at $1.20, which will have taken hundreds of multis out of play.